In Mexico a tostada is just a hard and crispy corn tortilla. But the secret is in what is put over the tostadas to convert them into delicious dishes that can satisfy even the most discerning palates. 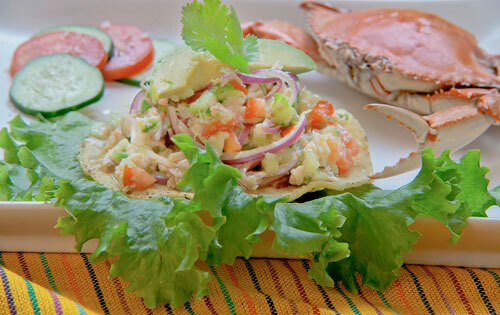 In this tostada we have the crab as main ingredient, that is a type of shellfish with white and fibrous meat. The crab’s flavor is delicate and it is widely used to prepare light dishes or refreshing snacks . In this recipe you will prepare a whole parade of flavors . This is because the tostadas are covered with a mixture of many ingredients like: tomato, onion, cucumber, coriander, lettuce, etc. The crab tostadas can be served as snack when you have a reunion or as entree plate. Although its best application is for those hot days... the freshness of these tostadas are the perfect remedy against heat. In this recipe you have to pay a lot of attention at the moment of cooking the crab, then everything is easy to perform. To prepare the tostadas you can buy raw, precooked or cooked crab. The only difference is that if precooked or cooked crab is bought you will save many steps and time in the preparation. If you are adventurous you can prepare your own crispy tortillas called tostadas. The preparation time is of 30 minutes . The recipe is for 8 tostadas. If you are going to cook this recipe with cooked crab – shred it, put it in a bowl and go to “Cut Ingredients" stage. Wash 6.1 lbs of crabs with cold water, then reserve. Cut into strips 1/4 of a lettuce, put them in a bowl and reserve. Dice 2 tomatoes, put them in the bowl and reserve. Finely chop 1/2 onion, 1 jalapeno pepper and 2 coriander sprigs. Upon completion pass them to the bowl and reserve. Peel 1/2 cucumber, cut it lengthwise and remove the seeds. Cut into small chunks the cucumber with the one you worked, upon completion put them in the bowl and reserve. Remove from the saucepan the crabs, with some tongs and rinse them with cold water. Remove the superior shell of all the crabs that were cooked. Remove the white meat of the crabs with a fork. Shred the meat that was removed from the crabs and put it in the bowl along with the other ingredients; then set aside. Beat the bowl ingredients with a balloon whisk or with the fork, until they are well integrated. Pour the dressing that was beaten in the bowl over the other bowl, where the crabs are with the other ingredients. Cut 2 avocados into strips and reserve. The avocado has to be cut at the end because it oxidizes fast and it turns to a darker color. Put the bowl ingredients over 8 tostadas, with a spoon. Put over each crab tostada some strips of the avocados that were cut. * Eat these tostadas quick, otherwise they will soften . Tip: You can also put to these tostadas some Tabasco salsa or some chipotle mayonnaise. Variation: If you prefer to enjoy these tostadas as snack, put the filling over some tortilla chips. Did you like the Crab Tostadas? If you are short on jalapeno peppers to give that hotness to your Mexican food. Don’t worry any more with the taste of “La Costeña Jalapeno Peppers" your food will have the hotness that you were looking for. Don’t bother anymore in squeezing limes. Let this fantastic lime squeezer do that job for you.